Harry Hobbs’s old recipe dates back to 1870, we have based the 2017 recipe on five of his original botanicals and added Lime Flower and Lemon Peel to give it a citrus twist, the 7th remains a family secret. Beginning with fragrant floral notes and soft marshmallow, zesty citrus adds clarity and bite amongst savoury juniper and sharp Orris root. Mr Hobbs suggests you pour a generous slug of his Henley gin over plenty of good quality ice, pair it with a premium tonic water and finish with a curl of orange peel to garnish. 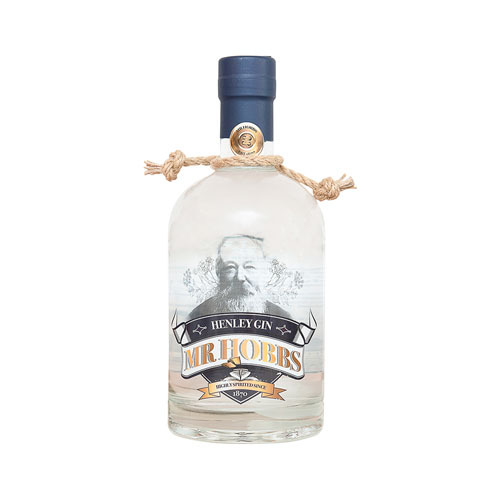 Mr Hobbs Gin is a 45% Distilled Gin with strength and flavour. The mix of traditional and local botanicals create a distinctive taste reminiscent of old style ‘Export’ Strength Gins. The introduction of a curl of orange peel brings out the citrus notes and gives a complex, long and smooth refreshing finish.